Martin Hopkinson wondered whether this painting, previously titled 'Mont Saint-Michel' was actually a depiction of a Neapolitan coastline, perhaps Ischia. The artist, James Webb, exhibited a painting of this title at the British Institution in 1866, as no.13. Similar paintings by Webb are also held in other collections. Museums Sheffield held no further information on the painting, but another painting by Webb of the same title features in their collection. The second 'Mont-Saint Michel' bears a greater resemblance to a work of the same title in the Tate collection. The collection agreed that the two paintings in their ownership must show different places. Attention turned to identifying the coastal fort shown in the painting under discussion. 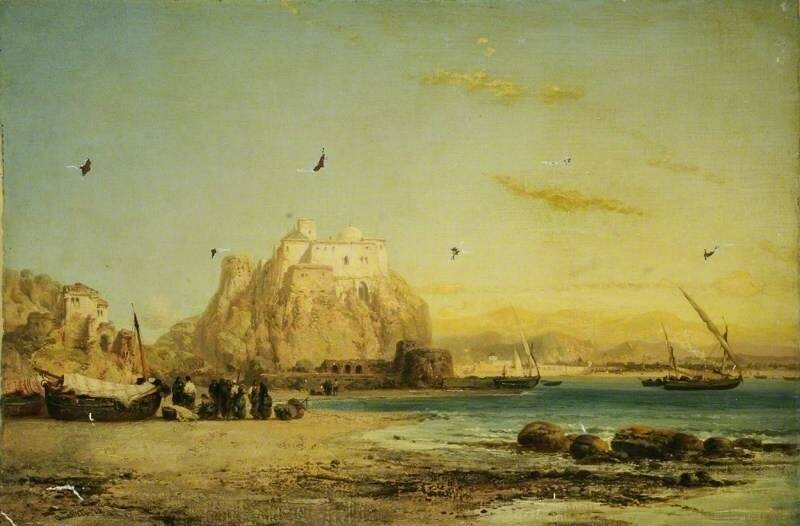 Anselm Bassano thought it resembled Castello Aragonese on Ischia. Frances Fowle suggested that, rather than depicting Mont Saint-Michel, the painting may actually show St Michael’s Mount in Cornwall. Pieter van der Merwe suggested the fort was the Aragonese castle of Ischia (Castello d’Ischia), pointing to the Mediterranean lateen-rigged fishing boats. Alternatively, it was thought the painting could be another variant of Webb’s views of Cartagena on the southern Spanish coast. The real identity of the location proved elusive, with mounting views that it was imaginary scene, borrowing elements from a number of coastlines. Art Detectives concluded that Webb painted some attractive and dramatic European coastal landscapes, but of dubious topographical veracity, and suggested that the work be retitled as ‘View of a Spanish Mediterranean Coast and Fort’. It was considered likely that the scene was inspired by Cartagena. Research on the Webb's biography confirmed his birth at Glebe Place, Chelsea, 11th April 1835. Museums Sheffield agreed with the suggested changes. The painting was retitled ‘View of a Spanish Mediterranean Coast and Fort’, and Art UK amended James Webb's year of birth 1835. Could this painting depict the island of Ischia, Bay of Naples?